Clowns on Bikes … for a cause of course. Sorry I missed this one folks. I’ll check email more regularly … maybe. Saturday at 1:30pm clowns on bikes “liberated” bike lanes and made them “safe” for cyclists. 2008 Liberation Ride via Flickr posted by Mandiberg. I don’t think I really need to explain why I find it delightful that clowns are riding amok on neon bikes. Question is, if you were a car behind them, would you honk along and join the caravan, or would that be poor form? And lest you feel this pithy post wants for description, here’s a video from last year. Note the dog’s “enthusiasm” for the clown in the fur coat. If you want in on the next ride on April 4th, get in touch with Time’s Up NY. Thanks to the Nonsense NYC list for spreading this. Old Faves: art, stunts and a video. Since this is a new blog, here are some old classics I would have posted about when they happened. ABSURD DELIGHT IN ACTION: … or at least wanton disregard for conformity. Human Mirror – Twins, lots of them, on a subway. Public Sculpture Tackle – athletic attacks on public art, in photo and video. 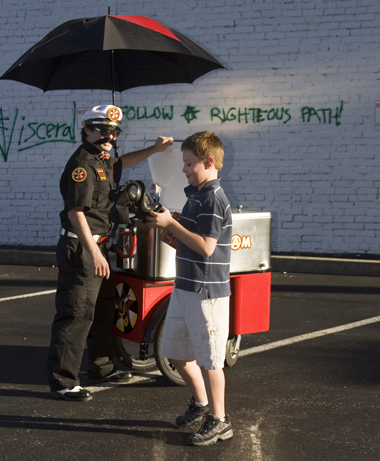 Take the time to click the link and read the wonderfully written propagansa on Tactical Ice Cream … whimsy meets rage in a delicious, ninja-inspired, art project. Here’s an article on all sorts of whimsical Ice Cream trucks. Why do I capitalize “Ice Cream”? And then this gem was a foundation funded local TV program (I think). Think Sesame Street crossed with math class on acid. Notable moments include wizards rapping, graffiti filmed in reverse and gratuitous fat kid humiliation. It’s educational people! More of this ilk to come soon. Send on suggestions.